Oklahoma City, OK January 11, 2018 – TSS Photography was recently named to the 2018 Top Franchise by Franchise Business Review. This is the 13th annual ranking of the top 200 award winning franchise opportunities. Franchise Business Review publishes its rankings of the top 200 franchises in its annual Guide to Today’s Top Franchises. TSS Photography is the leader in sports, school & event photography. TSS Photography offers the most technologically advanced systems for capturing and marketing images in the photo industry including a NEW facial recognition feature, mobile ordering, advanced green screen solutions and patented Virtual Groups. TSS owners enjoy working in their local communities with organizations that help with growth and development of local youth. Franchise Business Review, a franchise market research firm that performs independent surveys of franchisee satisfaction, provides the only rankings and awards for franchise companies based solely on actual franchisee satisfaction and performance. The top 200 list is also available online here. 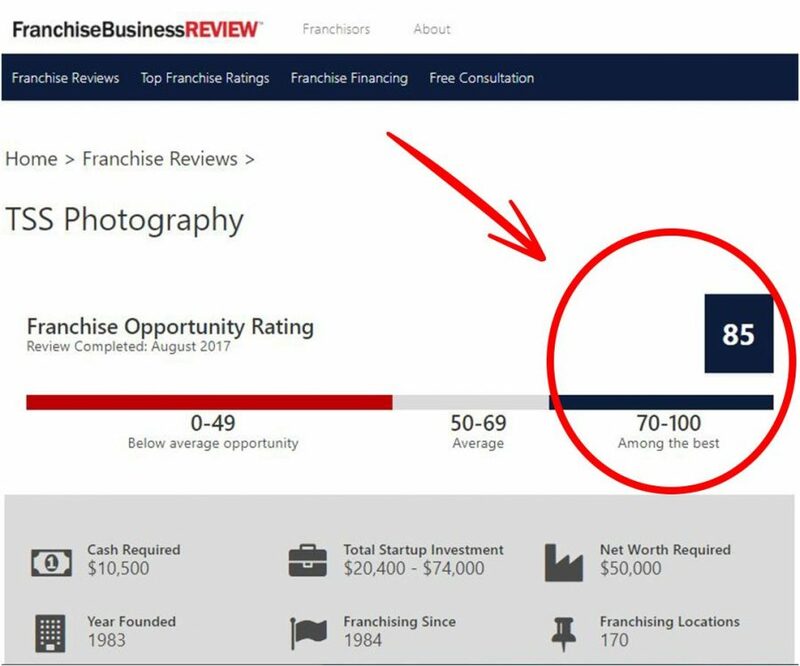 TSS Photography was among 307 franchise brands, representing over 28,000 franchise owners, that participated in Franchise Business Review’s research. TSS franchisees were surveyed on 33 benchmark questions about their experience and satisfaction regarding critical areas of their franchise systems, including training & support, operations, franchisor/franchisee relations, and financial opportunity. TSS Photography’s survey data showed owners rank TSS highly in areas such as training & support (22% higher than the FBR benchmark, with a score of 74.4 vs. 60.8) and Leadership team (15% higher than the FBR benchmark, with a score of 80.6 vs. 69.8). Based on these points and other survey data, FBR gave TSS an opportunity score of 85 (FBR considers scores of 70-100 to be “among the best”). In all eight key areas evaluated, TSS Photography scored either very good or excellent. “Our survey results and ranking are a result of our passion for our business. We also truly believe that we, as a company, are not successful unless our owners are successful,” says Alison Counts, Marketing Director for TSS Photography. Press release published on NewsOK, see article here. Click here to learn what it means to be a top performing franchise with Franchise Business Review.